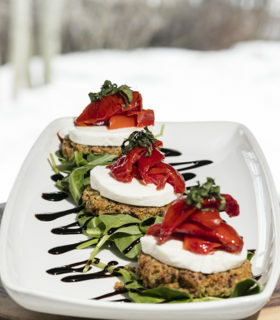 Three large quinoa cakes each topped with fresh mozzarella, sweet fire roasted tomatoes, basil and balsamic glaze. One pound of lightly smoked chicken wings fried crispy and tossed in your choice of sauce: John's Habanero BBQ or Traditional Buffalo. Served with carrots, celery and ranch or bleu cheese dressing. 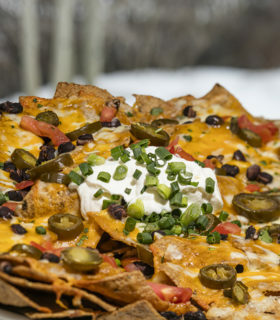 Gluten free black bean tortilla chips topped with jalapenos, black beans, diced tomatoes, cilantro, melted jack and cheddar cheeses, served with our fresh salsa, sour cream and scallions. Pretzel bites and bison jalapeno cheddar sausage, served warm on two skewers. Served with lingonberry sauce and beer mustard. 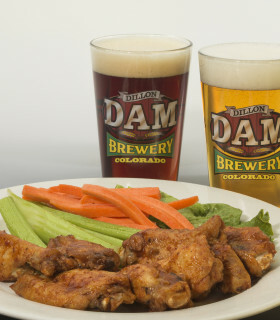 A distinctive blend of four cheeses and Dam Straight Lager beer served with your choice of fries or black bean chips. Beef chili baked with a creamy scallion cream-cheese mix. Topped with diced tomatoes and cilantro. Served with black bean tortilla chips. House-made tomato salsa, roasted tomatillo salsa, guacamole and roasted corn pico de gallo. House-made roasted garlic hummus with cucumber slices plus carrot and celery sticks. Served with warm naan flat bread. Salted and baked pretzel bites served with beer mustard and Lager Beer Cheese Dip. A basket of deep-fried, beer- battered, king-size Brewhouse onion rings with southwest ranch dressing. One pound of lightly smoked chicken wings fried crispy and tossed in your choice of sauce: John’s Habanero BBQ or Traditional Buffalo. Served with carrots, celery and ranch or bleu cheese dressing. Soft cream chese mixed with smoked trout and capers. Served with dried apricots, pecans and warm naan bread.